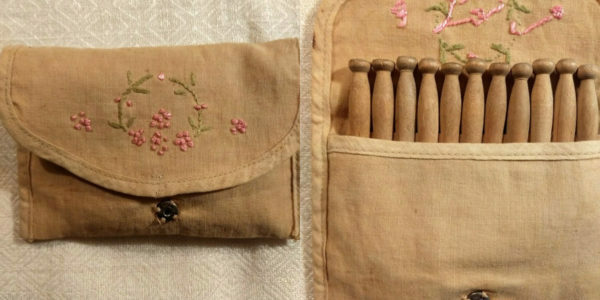 A clever mother or grandmother, of a child, made this sweet muslin case to store wooden play clothespin for hanging dolly’s laundry. Dating from the 1920’s or perhaps 1930’s. Embroidered french flowers knots, in pink, on a tan fabric, the case is edged with bias tape. A perfect size to hold 13 toy clothes pins. The fold over case snaps shut on the front.